Captain your boat across the Crystal Waters for a relaxing trip out to sea. Click here to play! 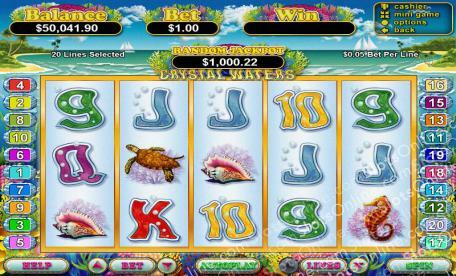 Make friends with sea creatures to collect a fair share of winnings. While you're sailing the calm, blue waters of the Atlantic you might come across several creatures that will help you in your goal to increase your account balance. Dolphins are known to be friendly and helpful, and in the case of Crystal Waters they are very helpful indeed. Not only do they act as substitutes but they double your prize money in any winning combination. Hopefully you'll come across the gentle giants of the water the Sea Turtles. Spin five of these creatures in a winning pay line and you'll get 2000 times your original line bet. Two to five Black and Yellow Fish will pay out 1250 times your wager and seahorses and shells pay out 1000 times your wager. You're sure to come across a few surprises out on the open waters. Not to worry though, these surprises will pay you handsomely if you're lucky enough to get three or more Yachts or Bonus Fish. Pull up anchor and take a trip through Crystal Waters for your chance to meet the creatures of the sea and win loads of cash. The Yacht icon acts as a scatter. Three, four or five of these icons will multiply your total bet respectively. Three or more Yachts will trigger a feature in which players are rewarded with 15 free games. If a bonus fish appears on reel 3 during your feature games it will substitue for all symbols except for the Yachts. It will also multiply the win by 2, 4 or 8. The friendly dolphin icon substitues for all other symbols excluding the scatter icons.